Address: No 8 Chua Boc street, Dong Da Dist., Hanoi, Vietnam. Asean International Hotel is located in the heart of rapidly expanding business, shopping and entertaining district of Hanoi. We are within of Giang Vo Exhibition Center, Hanoi International Super Star Bowl, Diplomatic Compounds and quick driving away from Noi Bai International Airport, Metro Cash & Carry Wholesale Supermarket. At Asean International Hotel, We offer refined dinning, luxurious accommodation and entertainment for both business and leisure travelers in The French architectural style building and decoration in the Tradition of The Friendliest Hotel in Town. Recognized as The Friendliest Hotel in Town because of its personalized service and attention to details, Asean International Hotel with it’s warm and cozy atmosphere will please most of demanding business and leisure travelers. 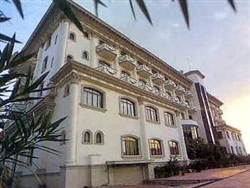 The hotel's has 66 luxurious and well - designed rooms with high standard of amenities. The elegant" A Dong” Restaurant specializes in Vietnamese traditional cuisines and delighted dishes from Japan, Korea, China to Western countries. Business Center provides fully secretarial services, conference and meeting rooms. Asean Club will help our loyal guests to relax with all the recreational services such as Fitness Center with Gym, Steam, Sauna, Jacuzzi, Body Massage, Foot Massage, Swimming Pool, Beauty Salon, Karaoke rooms. Tasting our services, you will find the differences and the satisfaction over your expectation. Tea, coffee, flowers and seasonal fresh fruits. Extended check out time base on availability. Living room with luxurious sofa. “A Dong “ Restaurant (150 seat) combines Vietnam traditional and Western Cuisine with professional, discreet service and luxury for both leisure and business travelers. “ Asean Bar” (35 seat) is located on the ground floor where you can select famous cocktail, drinks, hot and cold Beverages. Keeping your body in shape with our Health Club. In here you can make yourself relax after a hard working day or all day long traveling at our fully equipped gymnasium along with sauna, steam, Jacuzzi, body massage. foot massage and swimming pool. We also offer very special and high quality Beautiful Care Services such as body care, face making and so on. The famous aesthetic doctor and professional staffs along with high quality and famous branch name of cosmetics all are assure that you will be completely satisfied with our services. Karaoke and relaxation rooms with private bar will bring you unforgettable hours with your family, partners, colleges and friends for some special events like your birthday or just very simple happy hour after work. Pool-Side Bar, where to offer your wide-range of special drinks to help you more comfortable with our high standard and quality out- door swimming pool. Hereby, this is a such ideal place to swim and relax even in day or night time with our marvelous lighting system. The wonderful standing cocktail party on the pool is also your excellent option for some special days of your own, relatives or company.